Elaine Hancock (Olney, United States) on 7 December 2015 in Architecture. Built in 1881. Near Buckeystown, MD. It sure does look to be in a sorry state . . although the Cross is still determined ! Dommage, il reste de belles couleurs. Une belle photo j'aime beaucoup! Looks very dilapidated and beautiful !!! So long as God is not abandoned, it is fine !!!! 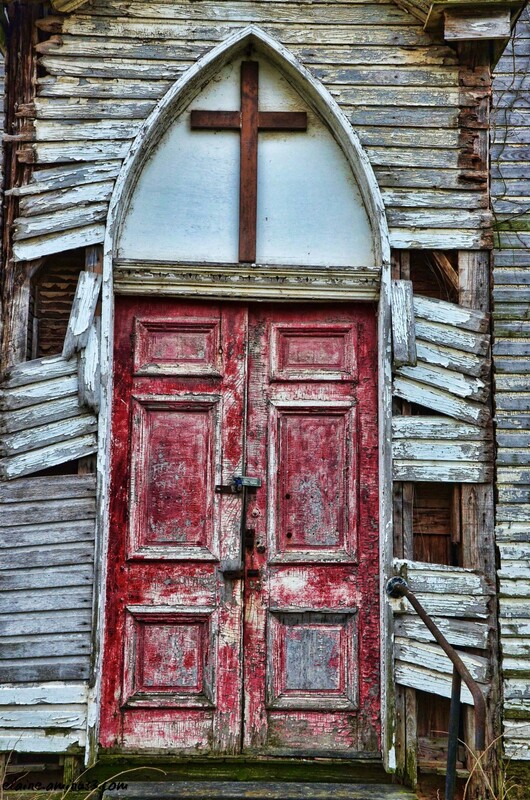 Love the flaky paint, the boards all askew, but the cross is seemingly unscathed by time and weather. A fine picture of these decaying doors wirth the broken paint. A superior shot for its detail and color. An interesting place. Calls out to go. 5 stars from me - I love the gritty treatment. The color and texture are superb. Oh, the stories this door could tell, and the lives who passed through it! Gorgeous weathered colors and textures.